Himalayans come in a variety of “point colors,” much like their Siamese relatives. These colors vary from registry to registry. In CFA, recognized colors are chocolate, seal, lilac, blue, red, cream tortoiseshell, blue-cream, chocolate- tortoiseshell, lilac-cream, seal lynx, blue lynx, red lynx, cream lynx, tortoiseshell lynx, blue-cream lynx, chocolate lynx, lilac lynx, chocolate- tortoiseshell lynx and lilac-cream lynx. Eyes must be blue. The face of the Himalayan is flat, like that of the Persian. The coat is thick and profuse, and the paws are large. Himalayans are gentle, calm, easygoing cats. They enjoy playing, but are not overly active. They also tend to be quiet. Himalayans with particularly thick coats need regular bathing to keep it clean. Daily brushing is optimal for these cats because their fur is prone to matting. The flat face of the Himalayan can lead to watery eyes and breathing problems. Himalayans need to be brushed daily to keep their coats from becoming matted. They also need frequent baths. The breed is prone to kidney disease. 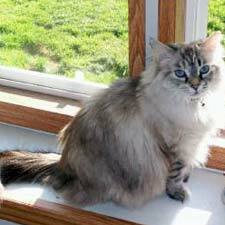 The Himalayan was developed in the 1930s by crossing Siamese cats with Persians. Dr. Clyde Keller of the Harvard Medical School and breeder Virginia Cobb of Newton Cattery are credited with first attempting this cross with the intention of getting a Persian cat with Siamese markings. After several cross-breedings, they settled on a male cat they named Newton’s Debutante to be the first official Himalayan. The Cat Fanciers Association recognized the Himalayan as a breed in 1957, but in the 1980s, changed the Himalayan’s designation to a variety of Persian. The International Cat Association also considers the Himalayan a variety of Siamese. Only the American Cat Fanciers Association recognizes the Himalayan as a separate breed.